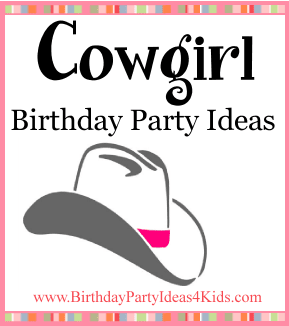 Cowgirl birthday party ideas including ideas for Cowgirl themed party invitations, decorations, games, favors and more. Everything you need to plan a Cowgirl themed birthday party. Decorate the cowgirl party with hay bales and scatter hay outside around the door to the birthday party. Buy cow balloons or make your own by drawing black spots on white helium balloons. Tie them onto the mailbox and/or in the front entry to the birthday party. Tie pink bandanas from tree branches outside. Pink bandanas can also be tied around the backs of chairs at the party table and also used as placemats. A blue, white or pink checkered table cloth is a nice backdrop for bandana printed plates, napkins and cups. Fill cowboy boots, metal buckets or tall glass vases with pretty sunflowers and tie with a bandana for a pretty centerpiece. Fill silver metal pails with snacks and use them to hold the flatware and napkins. Print out party information on large address labels. Then stick onto pretty pink bandanas and send them out to your party guests. In the invitation ask them to wear the bandana in a creative way to the party. The most creative use of the bandana wins a prize. Embellish plain note cards with stickers of horses or cowgirls items such as bandanas, hats and boots. Make cow spotted cards by drawing black spots on plain white note cards. Teach the guests how to square dance or Country line dance during the party. YouTube has videos that you can play to teach everyone or learn before the party and teach the dances yourself. Teach your party guests how to lasso a horse or a cow. You will need a long rope lasso plus something to rope such as a plastic kids horse or hay bale. Take turns trying to lasso the horses' head. Teach your party guests how to lasso a horse or a cow. You will need a rope lasso and a children's ride on horse. Take turns trying to lasso the horses' head. Party guests line up holding hands ... tell the kids that they must keep holding hands throughout the game. The line of kids makes up the rattlesnake. The child on one end of the line is the rattlesnakes head and the person at the opposite end of the line is the rattlesnakes tail. The head tries to tag the rattlesnake tail by weaving around it's "body" while the tail is trying to hide behind the body to keep from being tagged. When the tail has been tagged then the tail goes to the position of the head and then they try and tag the new tail. Keep playing until all the children have had an opportunity to be the rattlesnake head and the tail. There are different ways the kids can transfer water in this game. red solo cups - punch holes in the bottom so the water slowly leaks out. To play cowgirls will need 2 large containers filled up with water. Set them at one end and set up two jugs (like milk cartons) opposite them. Teams transfer water back and forth from the big water tub to the jugs. First team to fill their container up wins the relay. Teams dip their cups into the large tub, run to their jugs and empty the collected water into it and then race to their team to hand off the cup to the player in line that is next. Cut out slices of fruit with star shaped cookie cutters or place fruit squares on skewers. If possible have a campfire and make Smores or roast hot dogs. Pretty stick on star earrings or necklaces with horses or stars. Twizzlers candy for cowgirls rope. Party favors can be wrapped in a pink bandana and tied with raffia or ribbon. Draw black spots on white party bags for a cute cow goodie bag. 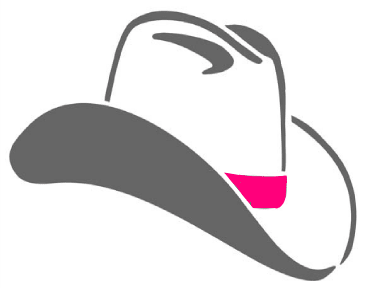 Place party favors in a pretty cowgirl hat. on our Western birthday party ideas page!